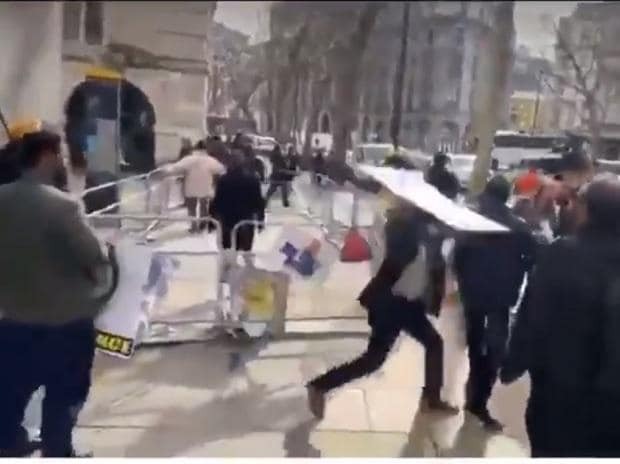 A clash broke out between groups of rival demonstrators assembled outside the Indian High Commission in London on Saturday. Scotland Yard said one man was arrested for "breach of peace" during a face-off between UK-based Kashmiri and pro-Khalistan outfits chanting anti-India slogans and counter protesters chanting pro-Modi slogans. The Metropolitan Police said the man was later "de-arrested, with no further action". Members of groups such as the Overseas Pakistanis Welfare Council (OPWC) and Sikhs for Justice clashed with counter-protesters from groups including the Friends of India Society, UK, during a demonstration called to protest against "atrocities on ethnic minorities in India". There were no reports of injuries during the clash, which involved several police officers intervening to control the few dozen protesters. Images and videos of the clash have since been posted on social media, with either side blaming the other for turning a peaceful protest violent.